Avaz has been featured in a TED talk and also listed on MIT’s Top 35 Innovations. •	Vocabulary that grows with your child: The vocabulary is arranged into 3 grades, with a consistent layout and motor patterns and quick access to frequently used sentences. The 3 grades ensure that the Vocabulary grows with that of the child. •	Visualize your child's progress: Track the child's communication development, and visualize it through rich, easy-to-understand graphs and charts. •	Scientifically built to enable the child to learn faster and recall better: Reinforce the word selection with animation, so that the child is able to learn and recall better. Color-coding with the Fitzgerald key makes Avaz consistent with other special-ed materials in the child's classroom. •	AAC that you can use even without an iPad: Print out the child's vocabulary as a book, which you can carry. 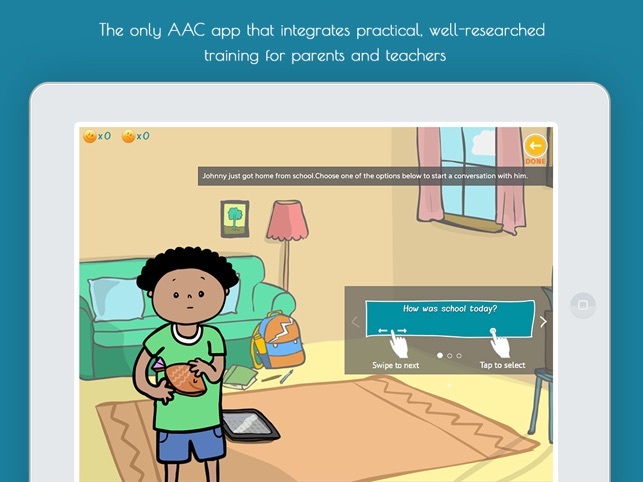 Make AAC truly a part of the child's life, even when the battery runs out. 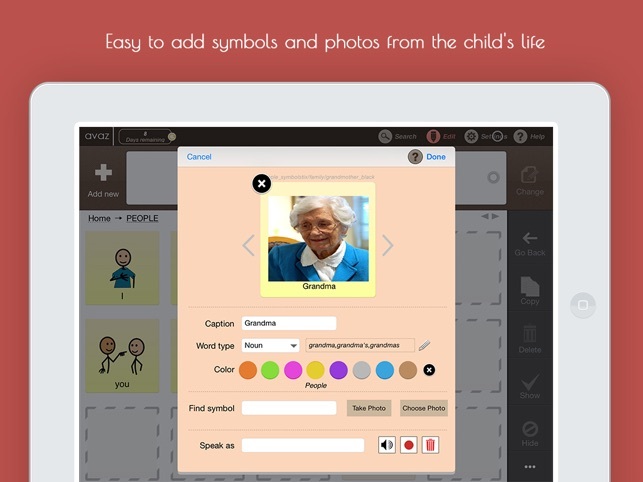 •	The fastest, easiest customization in any AAC app: Personalize Avaz in seconds with the words from the child’s daily life. You can add multiple words into Avaz in a few seconds. 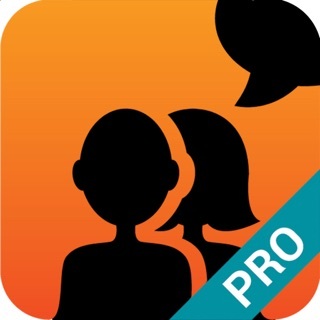 •	Learn the child's language - right within the app: Get ideas for conversations you can have with the child to develop their language skills, beyond just requesting. Learn strategies to engage the child and speed up communication development - in a simple, practical way. 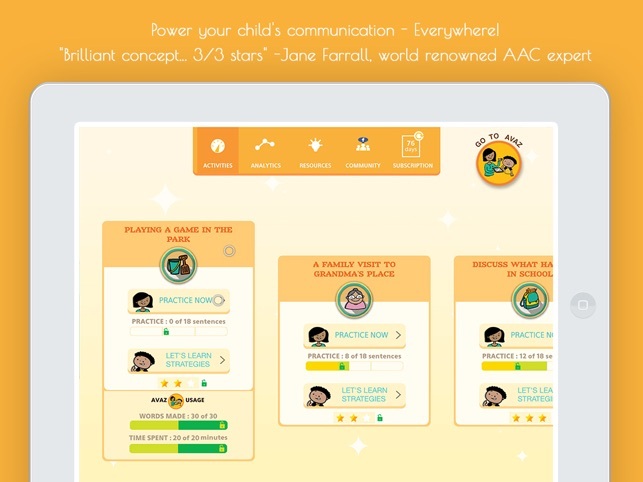 •	Integrate AAC in the child's life: Create more communication opportunities into the child's life, one activity at a time, through an activity-based dashboard. You will get conversation ideas, strategies, and modeling training for the most frequent activities of daily living. 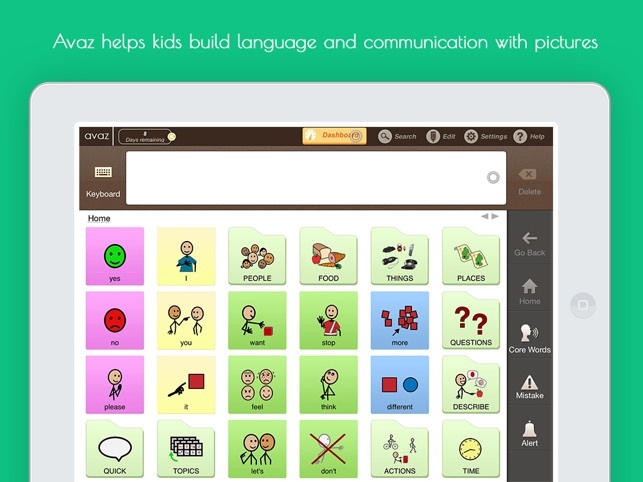 •	A bridge to literacy: The powerful Avaz keyboard is always just one tap away. It is the bridge to the child’s literacy. Avaz Live is now fully functional and easily accessible! Start an Avaz Live session and connect remotely with a therapist or a parent. You will be able to share your screen and remote control the other person's Avaz app to help them add vocabulary and modify settings to suit their need. We're extremely sorry to note that you're having an issue with the app loading on your kid's iPad. Not sure what you mean by that ,since we've not heard this from any one else! Do you mean "opening" the app or "downloading" the app? It could be due to a poor internet connectivity or insufficient space on your iPad, etc. In any case, I request you to please send us a mail at support@avazapp.com with more details, supported by videos of the issue; our Support team will do its best to sort things out quickly for you! 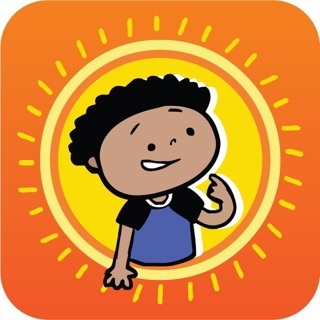 Nice education app with clear cut signs to illustrate the meaning of what children need to be taught, I'd like to recommend to improve the signs to make the app better and better, thanks for releasing the great app. 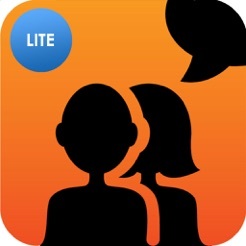 Thanks for the updates with lot of new features, keep the great work on and on please!